Kronos, lnc., located in Waltham, Massachusetts, provides a fully automated Workforce Management System that consists of the following three major modules: (a) Business Forecaster, (b) WorkForce Planner, and (c) Smart Scheduler. The Business Forecaster module uses historical data from POS systems, traffic counters, and other source to develop a forecast of future sales. The system is sufficiently flexible to allow the service manager to determine which variables are to be forecasted and the amount of historical data to use. The system can provide projections on a daily basis, as well as in hour, half-hour, and 15-minute intervals. Combining the sales projections from the Business Forecaster module with previously determined staffing guidelines and constraints, the Workforce Planner module develops worker staffing requirements that will meet the forecasted demand efficiently in terms of minimizing labor costs and effectively with respect to meeting established levels of customer service. These staffing requirements can be provided in the same time intervals as the forecast. Kronos considers Smart Scheduler to be the heart or' "engine" that drives their overall system. The staff find requirements generated by the WorkForce Elaine module combined with general work rules and specific constraints for individual employees are the inputs to this module. The output of the Smart Scheduler module is a detailed work schedule for the next forecast period, matching specific employees with specific shift assignments. To solve the problem. a monthly demand forecast is first made by product for each function. This demand forecast for each product is then divided by the production rate \ PIH) for those functions that the product requires. 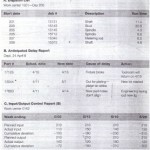 The result is the number of labor hour [HI std) 1 that are required to complete each function for that product. 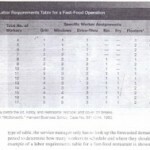 The labor hours are then converted into workers required per function. These figures are then tabled. summed.and adjusted by an absence and vacation factor to give planned hours, which are then divided by the number of hours in the workday to give us the number of workers required. TI1is results in the daily staff hours required (see Exhibit 12.10), which becomes the basis for a departmental staffing plan that lists the workers required, workers available. variance. and managerial action in light of variance. (See Exhibit 12.11.) In addition to their Lise in day-to-day planning. the hours required and the staffing plan provide information for scheduling individual workers. controlling operations. comparing capacity utilization other branches. and starting up new branches.